As promised in part 2 of this series, I'm back with the details of the energy audit I had completed at my house as part of the EnergyWorks program, as well as the big reveal of the first True Tales contest! (But you'll have to read to the end to find out about the contest details.) Last Monday, Feb. 7, was the big day I'd been waiting for! Eric Lowry of Lowry EcoSolutions showed up promptly at 9 a.m., and the audit began with a walk-through of the house during which Eric and I chatted about any specific issues I'd been having. My house is a pretty typical masonry two-story Philadelphia rowhome built somewhere around 1910. The issues I have are also pretty typical — drafty, cold rooms on the North side of the house, a lack of insulation in the attic and a relatively old boiler and hot water heater. I've made some educated guesses about what sort of energy efficiency improvements might yield the biggest bang for the buck at my house, and I was excited to see how my prognostications measured up against the recommendations of an expert. I know that my house is leaky, and I had done some air sealing in the basement a few winters ago, thinking that it would improve my comfort. It didn't. What I learned through the audit was that I didn't even begin to realize just how leaky my house is, and that I hadn't done nearly enough to seal up the basement. After Eric and I wandered through the house from the basement to the second floor, Eric took some measurements to get the square-footage of the house, and then he started performing some diagnostics. Since I don't have any access to my attic space, I offered to bust a hole in the ceiling of one of my bedrooms (which is currently under renovation anyway), so Eric could thread a pretty cool little camera up through the hole and take a look around my attic space. It turns out that I have a lot of knob-and-tube (K&T) wiring up there, which is pretty typical of a house of my age. Eric hooked up a blower door (see picture at right) to my front door. The purpose of the blower door test is to create a vacuum inside the house that mimics a 20 mile-per-hour wind against the side of your house. This vacuum makes it much more apparent where the leaks are, as it causes air to rush though them more quickly. Eric also tried to depressurize the house so that the combustion appliances (boiler, gas hot water heater, gas oven) could be tested for proper functioning under a worst-case scenario. Because my house was so leaky, it couldn't be depressurized. Bummer. With the blower door fan running, Eric did some leak reconaissance work. 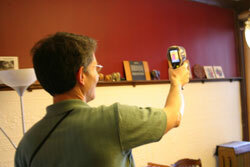 He traveled around the house with an infrared (IR) camera (see picture below), which allowed him to see the temperature of the walls, ceilings and floors. As I expected, my kitchen walls (which are on the North side of the house) were pretty cold, with some of them registering a chilly 51 degrees. Brrrr! No wonder my olive oil was congealing in its bottle right there on the counter! Wherever he found a leak with the IR camera, he took a picture with a regular camera for inclusion in the final report. After Eric documented all of the leaks, the audit was done. He had said I should plan for the audit to take four hours, but in reality, it was more like three. Eric said I should expect to receive a written report of his findings in a week. It came on Saturday evening, ahead of schedule. The air leakage rate was measured while the house was under a vacuum of 50 Pascals. For a house of my size, the normal range of air leakage is 471 to 674 cubic feet per minute (CFM) under 50 Pascals. Remember: I told you my house was a whole lot leakier than I ever imagined. The answer will be revealed in the next post in the series, where I'll also discuss the other results of the energy audit and what the next steps are to making my house more energy-efficient. For now, let the guessing begin!